Copyright © 1997 Hannabery HVAC. All rights reserved. 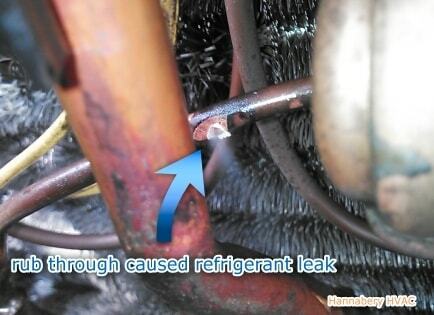 These are probably the most common Summer-Time HVAC-related complaints! But first things first, please check all of the obvious things (listed below), before scheduling a service-call. Is the thermostat set to "cool" and turned down below room temperature? Is the Power on to the indoor unit? Did you check the breaker? Is the Power on to the outdoor unit? Did you check the breaker? If yes to these, is the outdoor unit running? If no, see if the outdoor unit has a red reset button (most Rheem equipment does, located near refrigerant lines), and push it. If that didn't work, see if you have a condensate pump at the indoor unit. If you do, some pumps have a safety switch that shuts off the outdoor unit if the pump overfills and fails to pump. So check the pump to see if it is working. If that wasn't the problem, back outside at the unit there should be a disconnect box mounted on the wall. These come in many styles. Some have an on-off switch, some have a pull-out plug. Some have a circuit breaker and some even have fuses. If it has a breaker, make sure it didn't trip. If it has fuses, they should be checked. Caution: High Voltage, danger of electrocution. Please do not attempt this unless you are familiar with working with electricity. If you have checked all of these things, and your unit still isn't running, then you should schedule a service-call. If your outdoor and indoor units are BOTH RUNNING, BUT NOT COOLING, make sure that all windows and doors are closed, your supply and return vents are open - not blocked, and that your air filter is clean. If no problems there, then you should probably turn the air conditioning off and schedule a service-call. Below is a list of possible causes. Items in red usually require a service call. The bottom four causes in blue are commonly found problems and can be addressed, even fixed by the homeowner. Please keep in mind that the information found on our website is provided free of charge and Hannabery HVAC does not assume any liability resulting from the information we provide. We hope this information helps, but please note that these are just rough guidelines, and not all possible situations are covered. Your HVAC system should be inspected and repaired by a trained technician.